You are here: Contests / Are You October's Soldier of the Month? 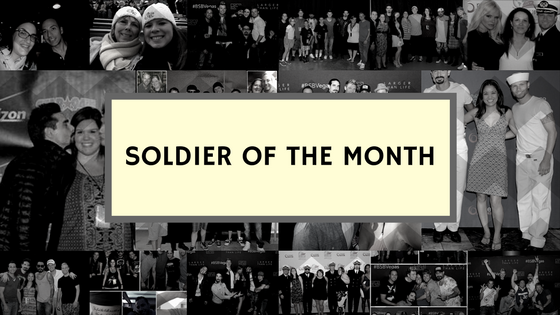 We're looking for one member of the BSB Army to highlight as October's Soldier of the Month. To enter, answer the following question: If you could pick five songs that the Backstreet Boys have never performed live, or haven't performed live in years, to be included in their next world tour, which 5 songs would you pick and why? It’s tough to pick just five songs when thinking about songs BSB have never performed or haven’t performed in years. My first song would have to be “Back to Your Heart.” This is one of my all time favorite Backstreet Boys songs and while I was lucky enough to hear it sung on the 2016 cruise in Europe during the acoustic concert as Kevin’s solo and on the “Into the Millennium Tour,” I would be ecstatic if I heard them sing it all together as a group again. Their harmonies in this song are some of the best and the end of the song with the different interwoven singing parts is hands down my favorite part out of all of their songs. I would just die to hear them sing it all together in present time as their voices have all matured since they recorded it for the Millennium album and I’m sure it would only sound better aged like a fine wine. Next, as a Nick girl, I’d love to bring it back to the Backstreet Boys World Tour days when Nick performed “Heaven in Your Eyes.” While I love “I Need You Tonight” there’s just something about wanting to hear it in its original form and it would totally bring me back to a time when I fell in love with that cute blonde boy with the bowl cut. For my third song I would pick “Feels Like Home.” I was lucky enough to attend a soundcheck where they did perform this song and the energy the crowd had was amazing and it was obviously a fan favorite to hear this song sung. I think this song would be a great addition to a WORLD tour set list as what better way to incorporate locations of the fans where they’ll be visiting on their tour? known as “No Goodbyes.” It’s hard to imagine a BSB concert without “I Want it That Way” but I think “No Goodbyes” would be a great way to update a timeless classic and surprise people with the other version. Lastly, after the last year with BSB and Florida Georgia Line working together, I’d love the chance for them to throw in “H.O.L.Y.” Hearing them sing this on CMT Crossroads was breathtaking. Can’t you just imagine being inside the venue when it’s silent and hearing them sing that song with their harmonies and smooth voices? I can only think it’d be perfection! I looooooove all Backstreet boys songs. I also love more that songs only huge fans knows, I dont know why, but I do. At the concerts, we all listen to GREAT hits, but, for this contest I HAVE TO choose songs they sang at the BSB Cruise 2018. This cruise was my first, I waited so long for this, and I was so excited for it, that I got CRAZY when they start to sing MY FAVORITE SONGS at Storytellers Concert. So I pick this songs below, and If at least one of them be added in the new tour, I promiss to attend at least 3 concerts in Brazil !!!! A...1- Just want you to know..Love this tune so up beat and the video is so funny..Last time I heard it live was on the Never Gone tour in London Wembley UK. 2...I Still....Another great vocals from the guys that would be amazing to see and hear live again on tour.. 3...Inconsolable...I know this is a single with out Kevin but I love this one so much and it gives me goosebumps when I listen to it...Again the last time I heard it live was on the Unbreakable tour in London 02 UK. 4...The Answer to our life...The only tour I never got 2c was Black & Blue as it never made it here in the UK,which is why I always ask for the tour to be on dvd so I can see the tour and not whats on Youtube..Such a great beat and words that I wanna see it Live on tour.. 5...I wanna be with you..From the amazing 1st Album that was so good I probably listened to a million times when I first brought it (1996) ,to make to CD break in half and had to buy a new one..So would love to have that on tour to bring the memories back of over 20 years ago..
Any time I hear this song, it creates a space of calm and clarity all around me. Seeing this performed live, it would bring me so much joy. I would dance like no one is watching. "What Makes You Different (Makes You Beautiful)"
This songs powerful and inspiring message is so uplifting, it needs to be performed live all the time. The boys talk about all the time, sacrifice, and tears they put into their music. I feel this song performed live would radiate that energy the most being inspired by all of the boys and their families. Watching this performed live touched my heart in such a way that I couldn't find words to describe it. "If You Want It to Be Good Girl (Get Yourself a Bad Boy)"
Nick said recently that he loved this song. It would be interesting to see why! If you want to be a good girl get yourself a bad boy. Don’t wanna to lose you now. I would love for them to put these songs in the Vegas concert 5 of my favorites. My 1st song would be Like A Child. I’ve only seen it in the special. I have always listed that song as my all time favorite. Between AJ and Brian sharing the lead and Brian finishing the way only he can... it’s an amazing song. 2nd song would be What makes you Beautiful. It wasn’t on their album, but happy they included it in thei Black and Blue tour. Howie and Brian singing together is rare... but it works. 3rd is very personal... Never Gone. I know it was wrote by Kevin about his fathers passing. I still have both my parents, but I requested that song to be played during my grandmothers memorial service. Knowing 3 of the 5 boys have now lost their father, it would be very emotional for them to perform. 4th would be Breathe - anytime Kevin gets a chance to sing it’s worth having to hear it Live. I missed the In a World Like This Tour since I was pregnant. Finally I would love to hear The Perfect Fan... I’m now a mother of a special needs child. I am able to be the mom I am today because of the Perfect Fan I had myself growing up.